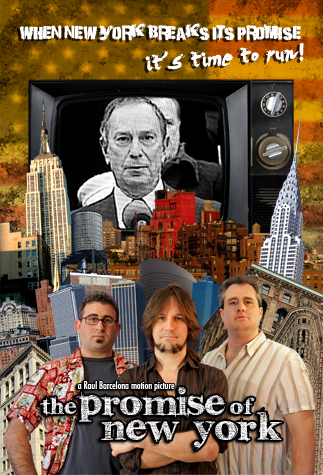 In his funny and provocative documentary, “The Promise of New York,” (Screening Fri., Sept 11 and Sat., Sept. 12 at Dixon Place) filmmaker Raul Barcelona assembles four unlikely mayoral candidates to give some insight into what it’s like to run against billionaire Mayor Michael Bloomberg in 2005, and the challenges they come across when they begin participating the complicated political process of running for mayor. The four come from all walks of New York life, and are given titles such as the Gadfly (Christopher Brodeur), the Blogger (Andy Horwitz), the Teacher (Seth Blum), and the Punk (Chris Riggs). They are supposed to represent ordinary New Yorkers, but fortunately for moviegoers, the four are very different, fascinating individuals who share (if they share anything at all in common) a burning desire to beat Bloomberg and make some real change in NYC—like Barack Obama kind of change. The difference between Barack Obama’s grassroots effort and theirs is that his supporters also gave him the money to run an efficient campaign. These guys are campaigning by the skin of their teeth. Christopher Brodeur, the Gadfly, notoriously known for heckling former mayor Rudy Giuliani during a 9/11 Commission hearing held in 2004 after he tired of listening to endless praises given to the former mayor, is able to create some real support. Despite running on the Democratic Party line, he is barred from debating fellow candidates who include Fernando Ferrer and Anthony Weiner. It’s easy to identify with his struggle because Brodeur reminds you of that politically in-tune, ultraliberal friend of yours who likes to rants about the pols at dinners and parties. Now imagine that friend running for mayor. Andy Horwitz, the Blogger, also reminds you of a friend you may have. He would be the funny friend who is running for mayor because he thinks it would be an interesting experience to blog about, not because he truly wants the burden of running the city. His journey is filled with comedic scenes and one very poignant moment. Seth Blum, the Teacher, reminds us of that one math teacher we had in school who really cared about his students and wanted to make algebra fun. As an educator working with New York schools, he disagrees with what Bloomberg is doing to the education system. He believes that educators should be in charge of education—not a mayor with absolute power over schools. Barcelona uses many of Blum’s scenes to teach moviegoers about the political process—the forms needed, the number of signatures required (and at what rate it would take to receive the thousands of signatures needed) and the bureaucratic approval needed to simply make it on the ballot. And then there’s the Punk, Chris Riggs. A wildly eccentric artist, Riggs’s mayoral run is more performance art than race to City Hall. The film makes a strong case for how easily New York’s political machine ignores average citizens who care about the city and want to make a difference. By the end of the film, we are left wondering what exactly is the promise of New York is and what our place is in it. Watching the film right before the primaries, we realize our place at this time is to vote. This is a film you should watch before you vote.